10Bet was founded back in 2003, with their online betting platform having attracted a large number of punters thanks to its excellent prices and speedy pay-outs. 10Bet aims to provide the most competitive and earliest odds on a daily basis, with their sportsbook covering a good number of sports in terms of both pre-match and in-play markets. 10Bet is licensed by both the Malta Gaming Authority and the British Gambling Commission, with the bookmaker claiming to have customers in over 90 countries as a result. 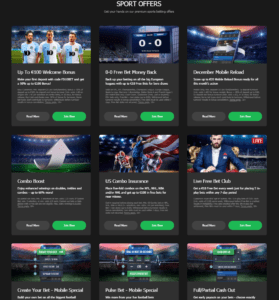 This 10Bet review will take a detailed look at their operation, with a particular focus upon the 10Bet new customer offer and other promotions for existing customers. The 10Bet offer for new customers means that the bookmaker will 50% all opening deposits made, up to a maximum of £100. A minimum deposit of at least £10 is needed in order to qualify, with the 10Bet bonus amount then having to be wagered x6 or more before any withdrawals can be made. Such requirements must be met within 30 days of registering an account, otherwise bonus funds will be forfeited. Enter the 10Bet website via desktop or mobile. Click on the “Register” tab in the top-right hand corner of the page. Complete the requested information, including creating a username and password. Select your preferred method of banking. Receive your 50% matched deposit bonus within just 24 hours. It is also important to remember to enter the 10Bet bonus code “FD10BET” when making an opening deposit, otherwise customers will not receive their bonus funds. As well as the 10Bet sign-up offer, the bookmaker also provides a wide range of promotions in which existing customers can take advantage of, which will help to both maximise winnings and minimise losses on their betting platform. Let’s take a closer look at some of the standout promotions available to 10Bet sports customers. Customers using the “Create Your Bet” feature at 10Bet are able to earn themselves a free bet, should their bet lose, but a goal was scored in the last 10 minutes of the game. In this instance, 10Bet will provide customers with a free mobile bet, up to a maximum of £10. Available on major Premier League and Champions League matches, a bet of at least £5 and total odds of 10/1 must be met in order to qualify. US sports are certainly prominent at 10Bet, with the bookmaker delivering a promotion surrounding the NBA, NFL, NHL and MLB. Customers placing an accumulator bet featuring five or more selections will earn themselves a free bet of up to £10, should just one pick let you down. Free bets can then be used on any sports market at 10Bet, with odds of at least 4/5 required. Football fans will be pleased to here that a frustrating goalless draw will potentially no longer cost you at 10Bet, with the bookmaker offering a free bet of up to £10 when your first/last or anytime goalscorer bet loses, but the games ends 0-0. This promotion is valid on every single game from all of the top league’s including the Premier League, Championship, Champions League, Europa League, La Liga, Serie A, Ligue 1 and the 1.Bundesliga. Horse racing enthusiasts are also well catered for at 10Bet, with those seeing their runner pipped to the post by a head or less earning themselves a free bet of up to £10 as a result. Punters selections must finish second in order to qualify, with win or each bet bets supporting this promotion. With more and more customers now placing bets via their handheld devices, 10Bet offer a range of mobile-specific promotions, including their “Pulse Bet” offer, which is undoubtedly one of the most exciting forms of wagering. Punters can be on a goal to be scored in the next 30 seconds, 1 minute, 5 minutes or 10 minutes, with the odds rising as the time period decreases. 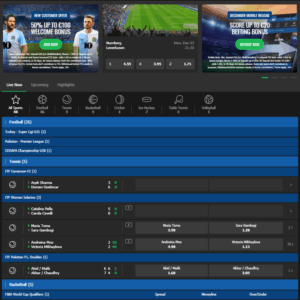 As well as this, the “Create Your Bet” feature is exclusive to mobile customers, which allows punters to construct exactly the type of football bet in which they wish to place. Finally, customers placing horse racing bets via their mobile will win a free bet up to £10, should your selection fall during the race. The 10Bet Free Bet Club gives customers a £10 free bet each week to those placing five or more in-play bets of at least £10. Available on all sports, punters must place 5 £10 in-play bets at odds of evens or greater between Monday and Sunday. In return, 10Bet will provide a £10 free in-play bet, which must be used within 7 days, at odds of 4/5 or more. There are over 30 different sports markets available at 10Bet, with the likes of football and tennis, along with popular US events from the world of basketball, American Football and baseball featuring heavily. The depth of markets is cetin to please also, with football in particular offering a huge amount of options from both high-profile and amateur matches and competitions. Elsewhere, the addition of E-Sports and bandy demonstrates 10Bet’s diversity. The 10Bet app is available for both iOS and Android users, meaning that there is never a reason to miss out on placing a potentially lucrative bet. The app is both fast and reliable, while exclusive features and promotions can also be taken advantage of. As well as this, all of the features found on their main desktop platform are also accessible, including live streaming, cashing out and banking. The relevant download links for iOS and Android devices can be accessed via the App Store and Play Store respectively, with the entire process taking just a matter of minutes to complete. The ability to cash out bets is now a must have for any online bookmaker, with 10Bet offering both full and partial cash out options on their sportsbook. Cashing out provides punters with full control, whilst being available on selected pre-match and in-play markets. The cash out symbol will appear on customer bet slips when available, with a proportion of your potential winnings being offered. Whilst in-play betting has long been one of the most popular features at 10Bet, the introduction of live-streaming by the bookmaker has taken their betting platform to a whole new level. Punters can now bet upon and watch the action as it unfolds, with world class action from major football leagues, tennis tours and basketball competitions, among others, available to view. Customers must have a positive account balance or have placed a bet of £1 or more on the event they wish to view in order to gain access, with all matches streamed in high definition on both desktop and mobile. As well as this, 10Bet also offer punters useful statistics surrounding in-play markets, which can potentially help in the decision-making process. There are a range of options available to customers when it comes to both depositing and withdrawing cash on their betting platforms, with all being highly secure and trustworthy. All available methods allow for immediate deposits, while 10Bet withdrawal times are also particularly pleasing. Despite having taken some time to make an impact in such a competitive industry, our 10Bet review has certainly demonstrated that they are now a name to be reckoned with. With a large number of sports markets, along with live streaming, cashing out and an efficient mobile app, 10Bet caters for all kinds of betting customers, including those looking to place significant wagers. What is the 10Bet’s sign up offer? The 10Bet sign up offer provides new customers with a 50% matched opening deposit, up to a maximum of £100. How to get free bets on 10Bet? In order to claim your free bet at 10Bet, customers must make an opening deposit of at least £10. There are also plenty of omngoing promotions that will help you earn free bets. Is there a 10Bet App for Android & iOS? The 10Bet mobile app is available to download on both Android and iOS devices, offering an excellent platform for those constantly on the move. Can you cash out on free bets on 10Bet? Full or partial cash out is available at 10Bet, helping to put the customer in control. What’s withdrawal time on 10Bet? Withdrawal times at 10Bet range from between 24 hours and seven days, depending on the method of banking selected by the customer. What’s minimum deposit on 10Bet? The minimum deposit available at 10Bet currently sits at £5, meaning that they cater for beginners. How to Gain access to live streaming on 10Bet? In order to gain access to 10Bet’s sports streams, punters must either have a positive account balance or have placed a bet of £1 or more on the event in which they wish to watch. Does 10Bet support live betting? Live betting is available at 10Bet, with a huge number of markets being available in this area. Sports such as football, tennis, basketball and ice hockey are available on a daily basis in this area.